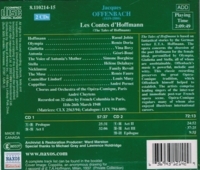 "This is a great performance from start to finish, and a document of Offenbach's unique opera as it was performed in the country of the work's origin for nearly a century after the world premiere This is also one of the few ‘Hoffmanns’ employing an all-Francophone cast, with the result that not only is the diction correct and clear, but each characterization is masterful. That begins with Raoul Jobin's open-throated vocalization of the title part and Andre Cluytens' conducting -- every vocal nuance, every tempo exactly right. No less impressive are the four incarnations of the Devil in baritones of which Charles Soix's resonant Dappertutto and Roger Bourdin's genuinely scary Dr. Miracle rarely have been bettered. This is a desert island recording." “French soprano Geori Boué was born on 16 October, 1918 in Toulouse and managed an exemplary career in her native country. She studied at the Music Conservatory in Touluse, taking on voice with Claude Jean, piano and harp. She made her début in Toulouse in 1938 and rose to fame singing staples of the French repertoire that include Marguerite from FAUST, Juliette from ROMÉO ET JULIETTE and Manon from Massesent’s opera of the same name. As her career progressed she expanded into other repertoire taking on Gilda in Verdi’s RIGOLETTO, Violetta in LA TRAVIATA, Mimi in LA BOHEME, Cio Cio San in MADAMA BUTTERFLY, Tatiana in EUGEN ONÉGIN, Desdemona in OTELLO and Thaïs among other roles. In later years CARMEN, WERTHER and numerous operettas would enter her repertoire. She also appeared in a 1943 film entitled LA MALIBRAN. Doria also sang in baroque music such as Rameau's LES INDES GALANTES, and contemporary works, such as Ravel's L'HEURE ESPAGNOLE, and Poulenc's DIALOGUES DES CARMÉLITES. In her thirty year career, Doria sang an estimated sixty rôles. Raoul Jobin made his debut at the Paris Opéra on 3 July, 1930, as Tybalt in ROMÉO ET JULIETTE. He quickly sang principal tenor rôles at both the Opéra and the Opéra-Comique, as well as in many cities throughout France, Lyons, Toulouse, Bordeaux, Marseilles, etc. He sang mainly the French repertoire, with occasional incursions into the Italian repertoire. With the outbreak of the war, he returned to North America. He made his début at the Metropolitan Opera on 19 February, 1940, as des Grieux in MANON. He remained with the company until 1950, where he sang many rôles alongside such singers as Lily Pons, Bidu Sayao, Licia Albanese, Rise Stevens, under conductors such as Wilfrid Pelletier and Thomas Beecham. He made regular appearances in San Francisco, Chicago, Boston, New Orleans, etc., also appearing in Mexico City, Rio de Janeiro, and Buenos Aires. After WW II, he returned to Paris in 1947, where he successfully sang his first major Wagnerian rôle, Lohengrin, earning him the nickname ‘Monsieur Lohengrin’. He later sang the role of Walther in DIE MEISTERSINGER VON NÜRNBERG with equal success. He also created the rôle of Fabrice Del Dongo in LA CHARTREUSE DE PARME by Henri Sauguet. Subsequently, Jobin divided his time largely between Europe and America, maintaining his high standard in his accustomed rôles while adding new ones, until his retirement from the stage in 1958. Géori (Georgette) Boué made her Paris début at the Opéra-Comique in 1939, as Mimi in La Bohème (singing in the 1,000th performance at the Salle Favart on 3 May 1951), and other rôles there included: Lakmé, Manon (singing in the 2,000th performance on 18 January 1952), and Ciboulette (first performance at the Opéra-Comique). Her début at the Palais Garnier took place in 1942, as Marguerite, and she went on to sing rôles such as Juliette, Thaïs, Salomé in Hérodiade, Louise, Gilda, Violetta, Desdemona, Tosca, Madama Butterfly, Tatiana, etc. Boué had a clear voice of considerable power, renowned for her impeccable diction, she was widely regarded as one of the greatest French sopranos of the 1940s. She was married to French baritone Roger Bourdin in May 1944, with whom she can be heard in two recordings, Faust under Thomas Beecham, and Thaïs. She retired from the stage in 1970. Fanély Revoil was a French singer who had a major career in opera and operetta between 1950 and 1989. In 1933, she made her first appearances in Paris, at the Théâtre de la Porte Saint-Martin in small roles before creating Madame Dubarry in the French premiere of LA DUBARRY. Following this success, others followed including Paris premieres of creations in VALSES DE VIENNE (1933), LE TZARÉWITCH (1935), UN COUP DE VEINE (1935), AU SOLEIL DU MEXIQUE (1935) and LA BELLE TRAVERSÉE (1937). After the Porte Saint Martin she made her début at the Opéra-Comique (creating the role of Lucine in LE TESTAMENT DE LA TANTE CAROLINE), and although never a member of the company she sang regularly with them for ten years, including Lazuli in L'ÉTOILE, la Guimard in FRAGONARD and the title role in CIBOULETTE. Revoil appeared many times at the Théâtre du Châtelet, in SOLEIL DU MEXIQUE, NINA ROSA, ROSE-MARIE, and created the title role in LA MARÉCHALE SANS-GÊNE there in 1948. At the Théâtre des Champs-Élysées she performed in the premiere of VIRGINIE DEJAZET in 1946. She made many foreign tours (Portugal, Netherlands, Italy, Britain) often alongside Willy Clément. After retiring from the stage she taught operetta singing at the Paris Conservatoire. As well as the 1941 recording of excerpts from L'ÉTOILE under Roger Désormière and the complete 1948 recording of THE TALES OF HOFFMANN under André Cluytens, Revoil sang in many French radio recordings of operettas and opéra-comiques during the 1950s, and appeared in the film LES DEUX GAMINES in 1936. Louis Musy was a French operatic baritone and stage director principally active at the Paris Opéra-Comique. His teacher was Léon David. He made his début in LE CHEMINEAU by Leroux in 1925 at the Opéra-Comique and went on to sing many other French and Italian roles in the Opéra-Comique repertoire. Musy was a member of the four-member committee which ran the Opéra-Comique after the liberation of Paris during 1944. From 1947 he was a director of staging at the theatre. His pupils included Xavier Depraz, Jean Dupouy, Jacques Loreau, Irène Sicot and Remy Corazza.